Discussion in 'Tutorials and How Tos' started by Superquad7, Jun 21, 2011. "So how to apply Gundam Water Decals? 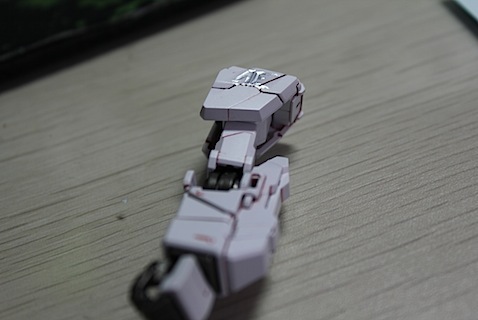 This post will provide a tutorial to apply Gundam water decal to your model kits. The basic tools you need would be water decals (obviously), Tweezer, art knife, water and toothpick or cotton bud. Optional but strongly recommended is Mr. Mark Setter to strengthen the bond between decals and model parts, second is Mr. Mark Softer to blend your decal with Gundam parts. First step is to cut the decal as shown above. Put the decals near the place you want, and then with the cotton bud, slowly slide the decal from the blue paper to the part. Sorry, I can’t provide any picture for this process because it’s extremely hard to use camera while doing this process on my own. The point is, slide from blue paper to parts using toothpick or cottonbud, then fix the position while the decal still wet. If you use Mr. Mark Setter, then apply mark setter before sliding the decals to Gundam parts. After fixing decal position, GENTLY apply Mark Softer above the decal to blend your decal with Gundam parts, please do not fix or move the decals anymore after applying mark softer or you will ruin your water decals. Let it dry naturally and you will get this result below. Ta da! It’s done. Simple, but very tricky to do at first.Hope this tutorial can help you!